The Lollipop guild is nothing to giggle at. Although, plenty of giggling goes on there. Members of the guild take their job very seriously. So when it comes to creating giant lollipops, they are sure to create the most colorful and the most lovely lollipop out there. Even if it's not actually edible. This made for a confusing experience for a lost Kansas girl that landed in Munchkin turf, but you'll find a giant inedible lollipop is good for a lot of things. Unlike sugar pops, this candy stick is water resilient. 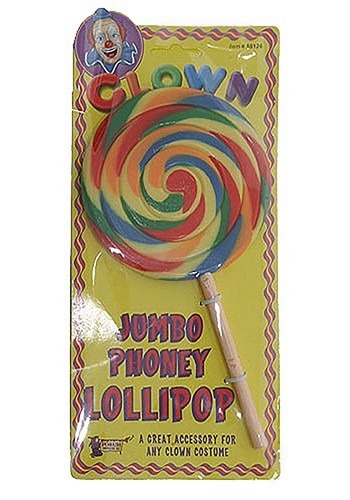 Which makes this a great lolly for rainy clown parades. Now you can gesticulate wildly, candy in hand, without worrying about it getting stuck in your colorful clown wig, or for that matter you neighbor's rainbow curls. This lollipop can be used again and again and is resistant to the strongest sugar fiends. If you happen to drop in on Munchkin land carrying this quality giant lollipop, they might just make you chairman of the board.